I am one of those people who make the resolution to lose weight each and every New Year’s Day. And yet I’m still carrying those unwanted pounds. Thus, I read books on motivation in the hope that one day I will find it in me to follow the suggestions. Marshal Goldsmith is a big time executive coach. He has worked with the likes of the head of the World Bank and Ford Motor Company, and his book Triggers boasts six and a half pages of glowing blurbs from various CEOs. If he’s good enough for them, he’s good enough for me. 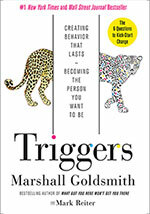 Goldsmith defines a trigger is any stimulus that reshapes our thoughts and actions. Our environment, he says, is the most potent triggering mechanism in our lives. I can relate to that. If I didn’t buy those cookies, they wouldn’t be in my environment calling my name. Still, knowing what to do and doing it are not the same thing. It’s a tug of war between the planner and the doer. We need to forecast our environment by anticipating what might trip us up, avoiding those things (like those cookies,) or adjusting. When changing our behavior, we have four options. We can change positive elements, in other words create new ways of dealing with our challenges, or maintain positive elements that are already working. We can also change negative elements by eliminating them or maintain negative elements by making peace with them. Additional questions can be added depending on what your specific issues are. The key is to ask yourself these questions every day. You are no longer monitoring results or the lack thereof. You are monitoring your own motivation and reinforcing your commitment. This is an eye-opening way to change your mindset. Question four is particularly meaningful for me. What questions would you add to the list?